Although Helene Schaffer’s life experiences have been varied, there’s one thing she knows for sure: she has genuinely loved what she’s done. 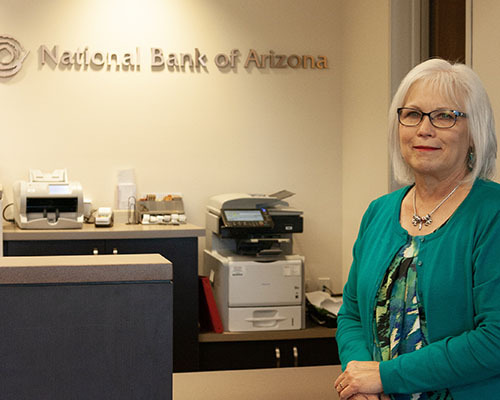 Helene, the Operations Supervisor of National Bank of Arizona in Prescott, is set to retire August 31, after nearly twenty years in the banking industry. When she does, she’ll celebrate by doing more of what she loves: spending time with her family and continuing to deepen the relationships she’s spent years building in the community. During her career in banking, Helene worked her way from the bottom floor to the top. It all started when she worked in the credit and layaway department at JCPenney, which inspired her to begin working at Valley National Bank, and then Bank One. Eventually, she landed happily at National Bank of Arizona. Meanwhile, Helene, who calls herself “pleasantly persistent” when it comes to her career and her volunteering, began sharing her passion and talents with the community. She was on the Prescott Downtown Partnership board for ten years. She’s been involved with Prescott Frontier Days for 28 years, and served as President of the Prescott Frontier Days Committee in 2000. She volunteers with the Yavapai Humane Society and helps with its “Walk for the Animals” and Gala events. The extensive list goes on from there: Helene volunteers for Big Brothers Big Sisters of Yavapai County, Habitat for Humanity, and more. Aside from her volunteer work, Helene’s family is her passion. She has been married to her husband, Bob, since 1973, and they have twins, a daughter and a son. “My family is extremely important to me,” she said. They have always loved camping and hiking, and Helene has a love for gardening. Starting in September, after she retires, she plans to spend more time outdoors gardening, traveling, and hiking the Prescott Circle Trail with Bob, who has been retired for two years already and is anticipating Helene joining him. Although she won’t be “working” in the banking industry, she’ll continue her involvement with her volunteer work.